It marked a political victory for Trump. He quickly claimed “complete and total exoneration", while his Democratic opponents expressed dissatisfaction with the outcome and vowed to continue congressional inquiries into his business and personal dealings. The Kremlin said following the release of Barr's summary that President Vladimir Putin was ready to improve ties with the United States but was up to Washington to make the first move. "In this case, the ball is absolutely in their court. It was given to Trump in Helsinki," Peskov said in a conference call with reporters on Monday, referring to a summit between Putin and Trump in the Finnish capital in July 2018. Peskov repeated Moscow's denial of any interference in U.S. elections and internal affairs or those of any other country. "...It's hard to find a black cat in a dark room, especially if there is no cat," Peskov said. Mueller's 22-month investigation ended with a finding that no one in Trump's campaign "conspired or coordinated with the Russian government", according to Barr's four-page summary of the confidential report. 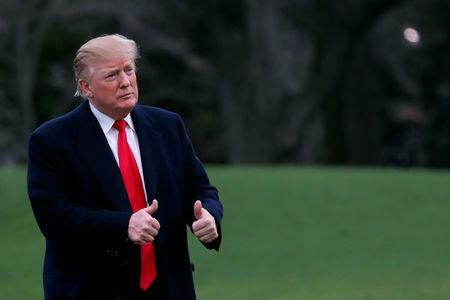 The long-awaited report into whether Trump's 2016 campaign colluded with Russian efforts to help him defeat his Democratic opponent, Hillary Clinton, marked a milestone in his presidency as he prepares for his 2020 re-election battle. Trump has described the Mueller inquiry as a "witch hunt", saying there was no collusion with Russia and denying he obstructed justice. He is certain to use the report to attack his Democratic opponents in the 2020 race. Many of Trump's opponents had accused him of obstructing the Russia investigation when he fired then-FBI Director James Comey in 2017. And Trump was clearly in a good mood as he returned to Washington from Mar-a-Lago on Sunday evening. “The report identifies no actions that, in our judgment, constitute obstructive conduct, had a nexus to a pending or contemplated proceeding, and were done with corrupt intent ... each of which ... would need to be proven beyond a reasonable doubt,” Barr explained in his letter to lawmakers. Nadler called for Barr to testify to Congress, citing “very concerning discrepancies and final decision making at the Justice Department”. Still, Trump's closest allies were delighted. Vice President Mike Pence hailed it as a "total vindication of the President of the United States and our campaign" and many Trump voters saw it as a victory over Trump's opponents.